Page speed is one of the most unnoticed elements of the Optimization. An average user waits less than 3secs for website loading, and if your website is not coping with that speed then you're in trouble. Website lacking the speed provides a bad user experience and which will eventually affect your ranking in the search engine. 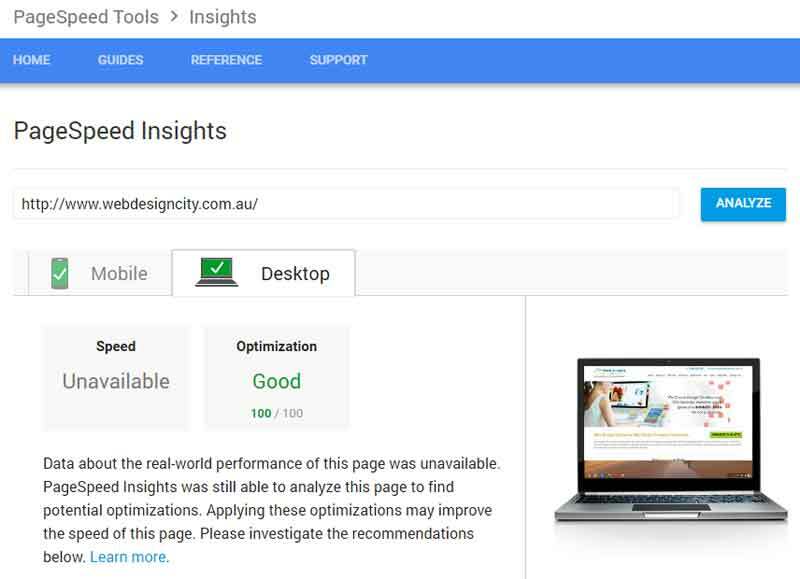 "If the Website is not User-friendly, it is not Google Friendly"
Page speed Insight is one of the excellent and free tools made available by Google. The tool provides you the real-time speed of your website running on any digital medium (desktop, tablet, mobile or laptop) along with the ideas of improvement. When you are selecting a service provider, check this parameter for their site. If someone lacks the Search engine ranking parameter themselves in their websites, how they will provide the solutions to yours? We at Website Design Sydney not only create a website but we work on your website’s entire portfolio, from making it responsive to making it search engine friendly, ultimately providing you boost in your search engine rankings. Our team operates keeping in mind the latest search engines trends to make your website appreciated by your customers. Let's start the conversation: PLEASE GET IN TOUCH TODAY.